DA Form 5435-1 - also known as the "Statement Of Understanding - The Selected Reserve Montgomery Gi Bill Kicker Program (10 Usc 16131)" - is a United States Military form issued by the Department of the Army. The form - often mistakenly referred to as the DD form 5435-1 - was last revised on February 1, 2016. Download an up-to-date fillable PDF version of the DA 5435-1 down below or look it up on the Army Publishing Directorate website. and Student Loan Repayments Program Records: and E.O. 9397, as amended. record. To determine Servicemember's qualification for selective reenlistment bonuses. (VEAP), and the Montgomery GI Bill (MGIB) Program. Disclosure of your SSN is voluntary, however, if not provided, could result in misplacement of records. incentive under the Montgomery GI Bill-Selected Reserve (MGIB-SR) Kicker Program. I am enlisting/reenlisting in the ARNG/USAR with assignment to a unit of the SELRES for a minimum of 6 years. a. 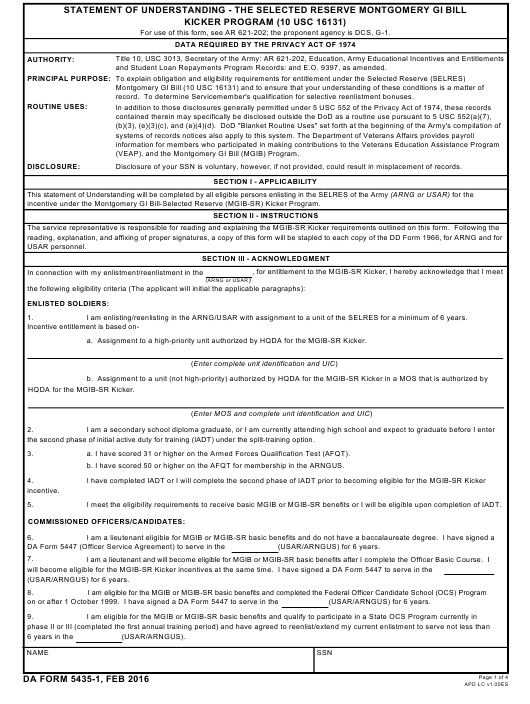 Assignment to a high-priority unit authorized by HQDA for the MGIB-SR Kicker. HQDA for the MGIB-SR Kicker. the second phase of initial active duty for training (IADT) under the split-training option. a. I have scored 31 or higher on the Armed Forces Qualification Test (AFQT). b. I have scored 50 or higher on the AFQT for membership in the ARNGUS. I meet the eligibility requirements to receive basic MGIB or MGIB-SR benefits or I will be eligible upon completion of IADT. of the Government to include normal career progression. I agree to serve satisfactorily in the SELRES for which contracted. than full-time pursuit of qualifying educational program. As a lieutenant, I do not have a baccalaureate degree. my secondary school diploma, completed initial active duty for training, and have been awarded my DMOS. incentive until my basic MGIB or MGIB-SR benefits are exhausted. I understand all incentive payments are subject to Federal and State income tax withholdings. served will equal 6 years. programs, result in suspension of Kicker benefits. failure or failure to meet body fat standard within a one year period will result in suspension of Kicker benefits. in any position or unit of any component as long as I am entitled to MGIB-SR basic benefits. Title 10, USC, Section 2107, my Kicker incentives will be suspended. to the enlisted position for the position for which I initially contracted. (termination will result in recoupment action). 2. If I fail to return within the authorized period of nonavailability, my Kicker incentives will terminate with recoupment action. will terminate with recoupment action. 4. If I complete less than 6 years in a SELRES unit under the terms of the initial contract; recoupment action will be initiated. a. Enters the second phase of alternate (split) training without proof of qualification as a secondary school diploma graduate. b. If I fail to meet qualifications for membership in the SELRES under law or regulations, to include medical fitness standards. d. If I become eligible for separation pay. close proximity to the unit I had been affiliated with and the position did not require a reduction in grade. another Reserve component for continued service in the SELRES. the Kicker benefits will terminate without recoupment. h. If I enter the Active Guard Reserve program in a non-critical MOS. i. Upon completion of the authorized maximum number of 36 academic months of MGIB-SR basic benefits. j. Upon reaching the 10-year delimiting date, except as provided for by the DVA. k. If I accept an appointment as a commissioned officer or warrant officer with consecutive assignment to the SELRES. l. If I transfer to Army ROTC Control Group for the purposes of accepting an Army ROTC scholarship under 10 USC 2107.
as an enlisted Soldier, I will be terminated from Kicker incentives. (1) I will continue to receive Kicker benefits according to the DVA policy when a TPU has been affected by unit transition. 36 academic months of benefits and I have basic MGIB-SR benefits remaining. Bureau authorizes continued receipt of Kicker benefits based on my enlistment into the ARNGUS. continued receipt of Kicker benefits based on my enlistment into the USAR. 8. Two consecutive APFT or body fat standard failures will result in termination of Kicker incentives. amount (total bonus authorized divided by 72 months). calculation indicates I have earned more than I have been paid,I will be paid a final payment in the amount due to me. d. Any refund made by me will not affect my period of obligation to serve in the ARNGUS or USAR. for the USAR), I am obligated to repay benefits received through the recoupment process. is not authorized. Delinquent repayment will result in the collection of interest on the remaining balance. applicant with a copy of this form.